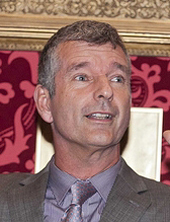 Tony Hawks is a TV and radio comedian and author. He is the author of the bestseller Round Ireland with a Fridge – the story of his absurd quest to hitch round the circumference of Ireland within a month… with a fridge. The book became a top 10 Sunday Times bestseller in 1998, was serialised on BBC Radio 4, and led to a six month TV advertising campaign for HARP Irish Lager. It has now sold over 300,000 copies worldwide including the US and Australia, and has been translated into several languages including Hebrew, Italian, Dutch and German. His second book, Playing the Moldovans at Tennis, published in trade paperback by Ebury Press has now sold well over 100,000 copies. The book was serialised on BBC R4 over Christmas. The story charts his latest foolhardy attempt to win a bet, which involved tracking down all the members of the national football team of Moldova and beating them at tennis one by one. Tony’s book was shortlisted for both the Samuel Johnson Prize for non-fiction writing and the Bollinger Everyman Wodehouse Prize in 2000. He has appeared frequently on TV comedy programmes such as: Have I Got News For You, They Think It’s All Over, Paul Merton, A Bit of Fry and Laurie and Red Dwarf. He also hosted the BBC1 programme, The Best Show in the World Ever … Probably. He is also a regular guest on radio programmes including The News Quiz, Just a Minute, and I’m Sorry I Haven’t A Clue, and recently he presented his own series on Radio 4, Tony Hawks’ Lost Weekends.